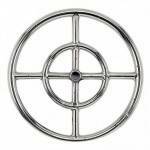 Made of 304 stainless steel, our gas fire pit ring burner is not only elegant to behold, but also very durable. It can withstand extreme temperatures and harsh weather without any damage or discoloration. It will last you for many years to come! To be used with a 2 - 4-inch layer of fire glass for the most spectacular effect! Our high-quality gas fire pit ring burner is designed to delight all onlookers with its amazing flame. The cross bar design allows for a truly realistic and evenly distributed flame and the burner holes have been drilled, not punched, which means no whistling noises are produced. 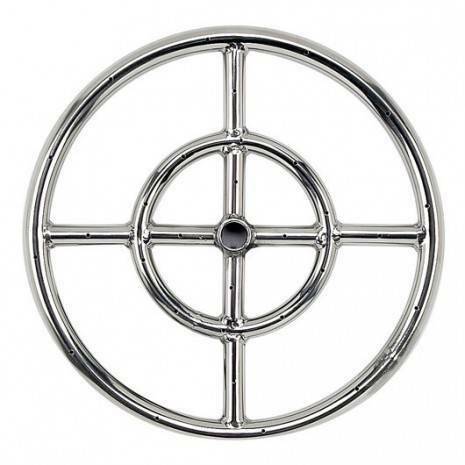 Our gas fire ring burner also comes with a convenient ½ inch gas inlet for easy connection to a natural or propane gas supply. It can be easily installed without any professional help. Material: Hand crafted with high quality 304 stainless steel. Application: For use in outdoor vented natural or propane gas burning fire features ONLY.